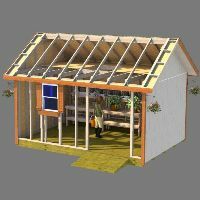 I bought the plans about 13 months ago (funny... it seemed like a year and a half) but had to put off building when my contract job came to an end Aug 2012. I took a job in the Middle East and last month went home for vacation. 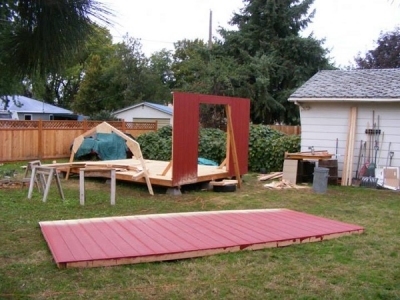 After moving my son to Klamath Falls, OR with his new wife I got home to my wife who just had back surgery and prepared to begin the build. I had 17 days left so I began in a fury. 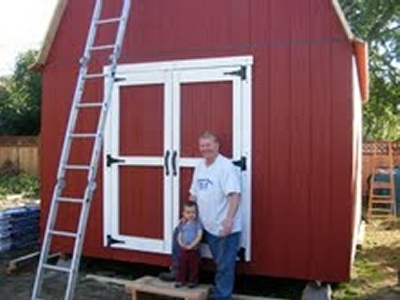 September brought rain that hounded the build from the beginning but I persisted and set the barn on skids and blocks. I leveled and squared without any help which probably sounds normal, but this was my first such project and quite a feat for me. I had purchased the skids 13 months prior but one warped and to save time ordering one again I purchased a 4x6 p/t. 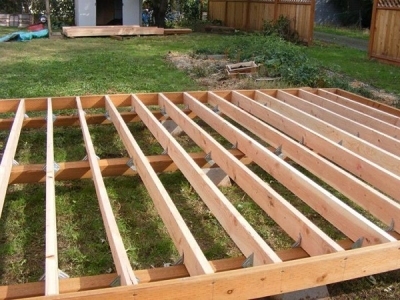 I chose to buy p/t band boards with untreated joists placed at 1ft intervals using hurricane ties and coated screws. I opted for inch and a quarter tongue and groove ply. Who knew that would leave a 3/4 inch gap on the side so I cut away 11 inches and bought an extra sheet to cover the deck to the edge. I treated the deck two days before a downpour that caught me off guard. Whew! I built the front and back walls and painted. Since the front wall was on deck I stood it up . I trimmed all the bottoms to match the band boards. I should have swept the sawdust off but didn't. It's still there. It's Nice To Have Helpers! 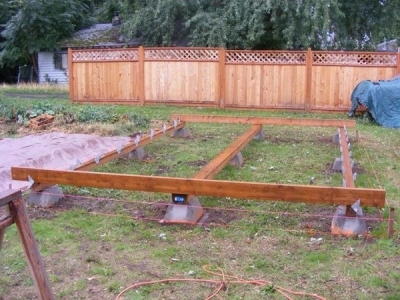 12 good friends came over and we put up the walls and trusses in 50 minutes. I did the loft under work lights myself and finished at 11pm. 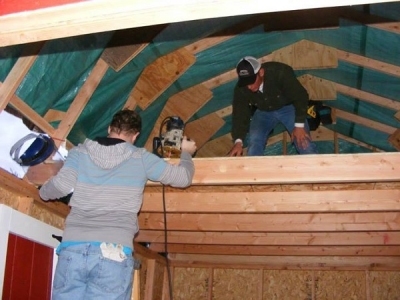 I used 6inch lag bolts to bind the trusses to the walls and 3inchers to bind the loft joists to the trusses. I also bought a tarp in case of rain on day one. Good thing. 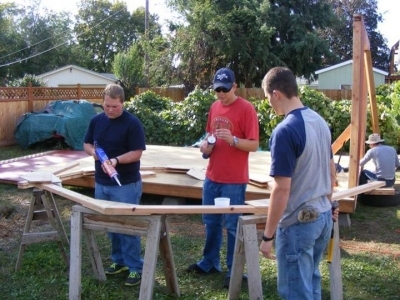 Rod Set His Loft Joists First..
Friends helped to nail in the loft plywood. The roof and fly wings done, I scrambled to finish other things and worked right up to one hour before departing back to the Middle East. 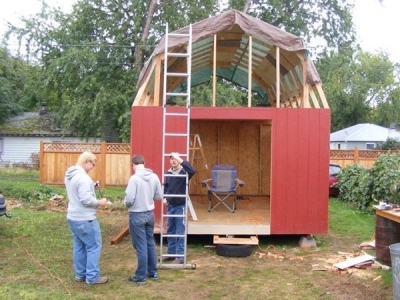 Another couple of days and I think I could have gotten the roof done. 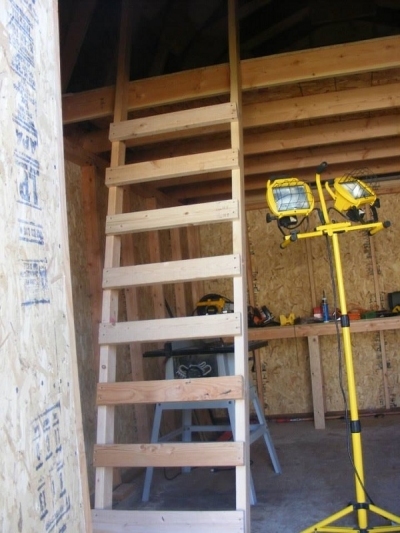 I put in a quick ladder to the loft and a 12'x2' work bench with two shop lights. One on the workbench and one above the entry area. 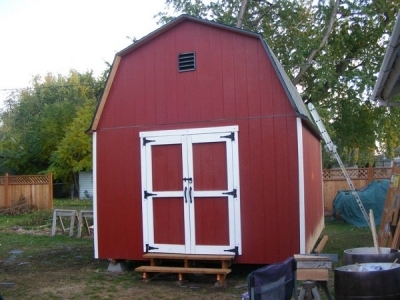 Rod's 12x16 Barn Shed! Great Job Rod! I also put in steps and the doors are quite a site. 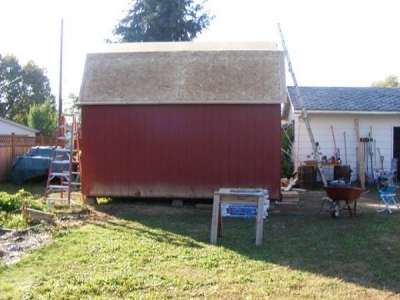 Good friends are hard to find and mine finished the roof and added the anti-ice edge for my area. Some things will wait till I get back next summer, but I got these pics to drool over until then. 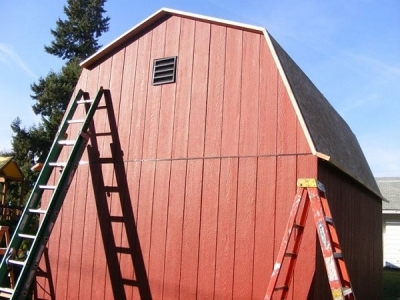 One old carpenter who has built three homes by himself in days gone by said he has never seen such a great first construction project as my barn. Everyone is quite impressed and I just love it. 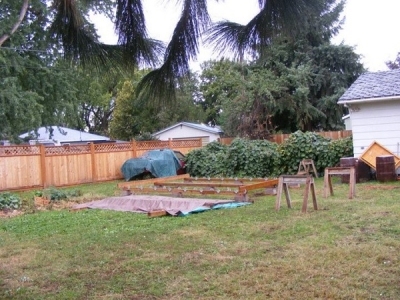 Of course, the real secret was the plans from the Shed King. 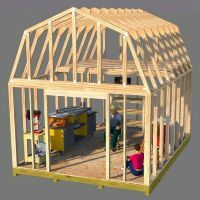 Six bucks is a steal for all the details covered in the plans and additional info on the web site. 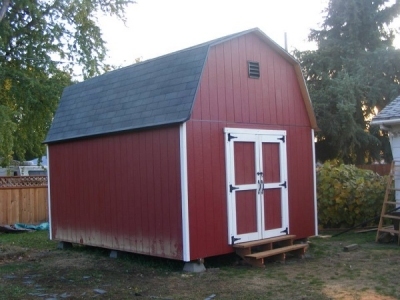 Rod, thank you for purchasing my 12x16 barn shed plans! 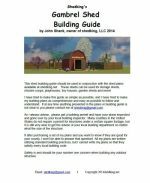 What a wonderful job you did in the construction of this small barn, and thank you so much for taking the time to submit photos of all your hard work. 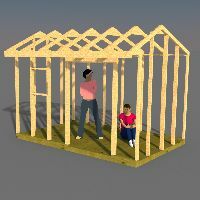 If you are interested in building this shed you can find the plans here.